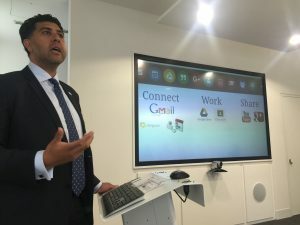 In June we hosted our first Google in Education Summit at the Jisc offices in London. This event brought together colleges and universities that use Google Apps for Education and related products to discuss their experiences, and how they would like to see Google for Education products develop. Senior staff from Google were on hand to hear from institutions, and to present on recent developments in the Google for Education product suite. We also took the opportunity to do a little “future gazing” and imagine how a few of Google’s current R&D projects might translate into future products for teachers and learners. Kicking the Summit off, we heard how Warwickshire College Group and the University of York had used the cloud-based collaboration tools of Google Apps for Education to save money and work more efficiently. For example, Warwickshire College Group had saved over £50,000 a year by encouraging staff to try Google’s Hangouts conferencing tool as an alternative to face-to-face meetings. The University of York used Google Apps with some 3,500 staff and 18,000 students, and had made extensive use of Google Forms and Apps Script to automate routine tasks. 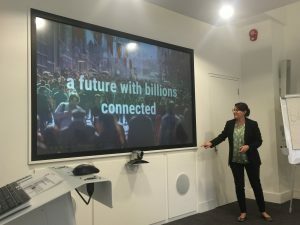 Liz Sproat, Google’s Head of Education for Europe, the Middle East and Africa, advised Summit delegates that Google Apps for Education now had over 60 million users around the world, with particular interest being shown by schools and colleges. Liz updated the group on recent developments including a radically updated version of Google Sites, Android compatibility for Chromebooks, and Expeditions virtual field trips. We structured the Google in Education Summit as a highly interactive event. Delegates were able to provide feedback about their experiences with Google for Education products and services, and share their ideas about future developments of these tools. Delegates were particularly interested in Classroom, which many felt had the potential to replace long established Virtual Learning Environments like Moodle and Blackboard. Jisc and Google were encouraged to explore Classroom integration with Jisc’s new learning analytics pilot service, which aims to provide students with a “Fitbit for learning”. Delegates were also keen to see plagiarism detection services such as TurnItIn and Urkund integrated with Classroom, and suggested a large number of small incremental usability improvements to Google for Education products. An example of the usability improvements discussed at the summit was the suggestion that Google Apps administrators should be able to apply for extended YouTube video posting rights for all of their users – at present a separate request needs to be made for each user that would like to post long form YouTube videos. From the research lab to the classroom? Project Soli. Ever felt frustrated by small screens on phones and smartwatches? Soli turns any surface into a controller, so you really could have an interactive carpet, table top. Delegates felt that Soli had huge potential for transforming learning spaces, and helping educators to make learning more inclusive. Project Ara. A modular smartphone that can easily have components swapped out and new ones added. What modules could your students imagine? Could learners from the maker generation then could go on to build them, as a piece of project based learning? Project Jacquard. Can you picture interactive clothing that creates a “personal area network”? Project Jacquard lets you create it by weaving conductive yarn and sensor grids into clothes. It is too early to tell whether the likes of Soli, Ara and Jacquard will ever make it out of the lab and onto the production line. However, we have just seen the launch by Lenovo of the first Tango enabled consumer smartphones. Developed by ATAP, Tango is a 3D scanning sensor that gives apps positional awareness of their surroundings, so for example you could hold your phone up to watch a virtual dinosaur pace your living room carpet. Delegates felt that Tango would a very effective way to explore adding Augmented Reality to hands on teaching in areas such as Science, Technology, Engineering and Medicine (STEM) subjects and vocational training such as car maintenance. In the words of author William Gibson: “the street finds its own uses for things”, and it will be fascinating to see what teachers and learners alike discover that they are able to do with these new tools and technologies. Delegates were, however, keen to emphasize that technology should always be viewed as a means to an end, rather than an end in itself. There is a terrific podcast where hear from colleges and universities about how they are using Google tools, as well as Liz Sproat, head of education EMEA (Europe, the Middle East and Africa) at Google, about the latest product and service developments. If you can see yourself exploiting these new technologies for teaching and learning or research, why not get in touch and let me know how you would use them – I’d love to hear from you.